So much to fill in on just a few short days in Nashville: Art, friends, new friends, selling art, bartering for art, buying art .. all about "for the love of art". One thing about a blog is that it's making me slow down some to write about the day to day and it's fun because I get to experience things again when I write. I guess that is one of the joys of writing. I am smiling just thinking about this weekend. In one word, it was magical. Arriving at the hotel and receiving a fun gift bag from my dear friend, Jill. It was filled with lots of good stuff and chocolate and magazines and the best part was a shirt, hat and mug that had the theme,"Thinkhappystuff.com". Love that! Thank you Jilly Bean! Hanging out with Jill and her fun family at the art show. Her husband, Ronn, was one of the artists at the show and has such great art! Can't believe I didn't take a pic of his Eiffel tower painting, what was a I thinking?? Jill's two precious girls are in the pic above (in their blue and pink shirts). They are so much fun and Jill makes me laugh continually! Thank you Jill for being YOU! Can't wait to hang out with you, Lauren and Lily Kate at French Camp! And to the sweet group of girls in the above photo! Had so much fun with them at the show and it was great to watch them go up to paintings, pick out their favorite ones and get excited about art. They were all so dear! 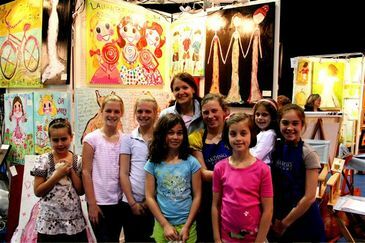 They were a great reminder of why I love creating art: for people like these girls- passionate, playful, carefree, full of life, love for art and beauty, kind and fun. They were wonderful and great inspirations! The volunteers at this art show were amazing. They worked the show in a very organized, efficient and yet most beautiful way. They cooked all these delicious meals for us, they were always so helpful and kind. ( Just like their daughters). You could tell there is great community and love in the school and it shined out everywhere. It was inspiring to see the student's own art on the walls and their love for art. A beautiful school with a beautiful community. And then to the artists. Loved getting to know the artists around the show. To see all the creativity and talent was energizing; and the buzz everywhere was incredible. So many sweet fun people to talk to and get to know. And to top off such a great show... Mike bought his first painting! Yep! It's official. Mike's first real piece of art. 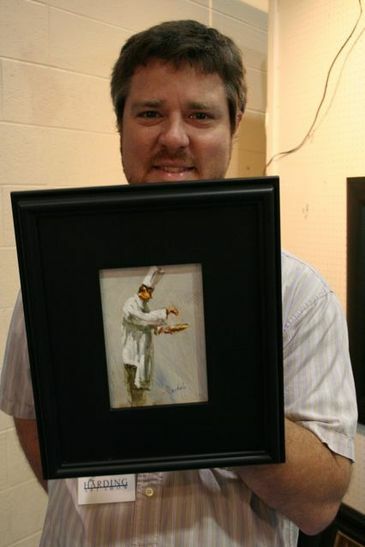 This piece spoke to him because it is a chef and he is sprinkling these tiny little yellow sprinkles on a dish. ( Mike loved the sprinkles). I think it is very special because Mike loves to cook. 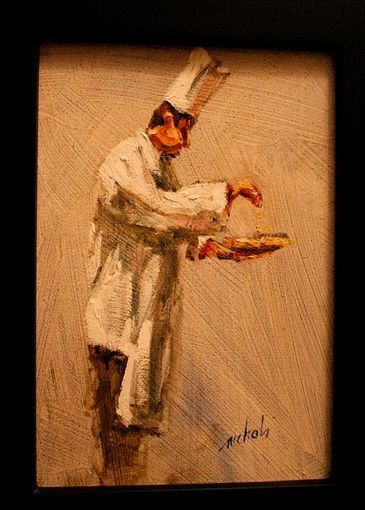 (loves Top Chef) So, this painting is a symbol of one of his passions. We have it hanging up in our kitchen! Yea!! The artist behind this beautiful painting is David Nichols. He was a very kind man with great talent. Up close pic of the sprinkles.. you have to look very close! Cupcake joy! Bought this little cupcake and it is hanging right by the kitchen sink. Makes me happy every time I look at it. 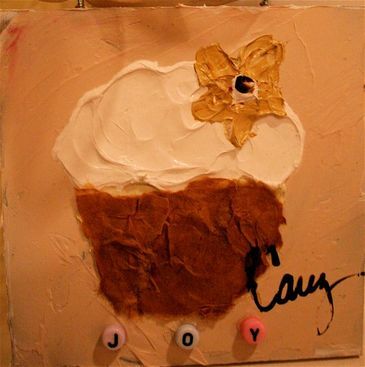 Cary painted delightful cupcakes and cakes and dresses! Aren't those words fun to say all together? On top of our happiness with purchasing real live pieces of art, I bartered with another artist. Picked out this adorable sweet cow! Love her! Now, she needs a name. The cow symbolizes my love for the country. My dream is to live on a farm and right now it is ok just to have that in my dreams. So, my cow adds some "farminess" to our "farmhouse" in Birmingham. 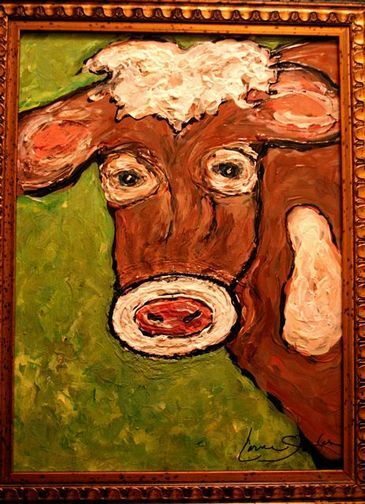 The wonderful artist who painted this cow is Lorna Sanders. Thank you Lorna! Love my cow! But the fun doesn't end. I met another great artist and we bartered too! A red barn is what Mike and I picked! 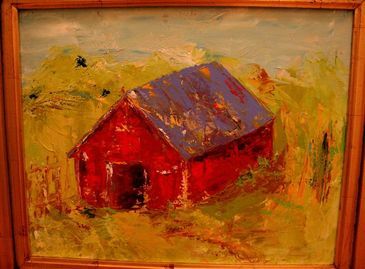 This barn is happily painted by Melissa May, a wonderful artist! She has a gallery in Chattanooga that I can't wait to visit. Love the barn! Yipee! Another symbol of farm life. Think it is in my blood because both sets of my grandparents lived on land. My mom's parents had a ranch in Nebraska and my dad's parents had a farm in Nebraska. So, I think the love for land is just there. Now, I have the cow and the barn.. makes me so happy. We have a chef, barn, cow and cupcake hanging in our house, makes it more cheerful and soulful as well! What I realized with all of the fresh excitement over our new paintings was that I can relate to others when they get excited over buying art. It's fun to watch paintings head to their new home and see the new owners with big smiles on their faces. I think to myself, " I know just how you feel!" Thank you Harding Academy, the great group of girls and volunteer moms, my dear friends ( Jill, Ronn, Lily Kate, Lauren, Georgia and Wilson.) and new art friends. Most of all, thank you sweet husband for helping me every day of this show and being my greatest support.